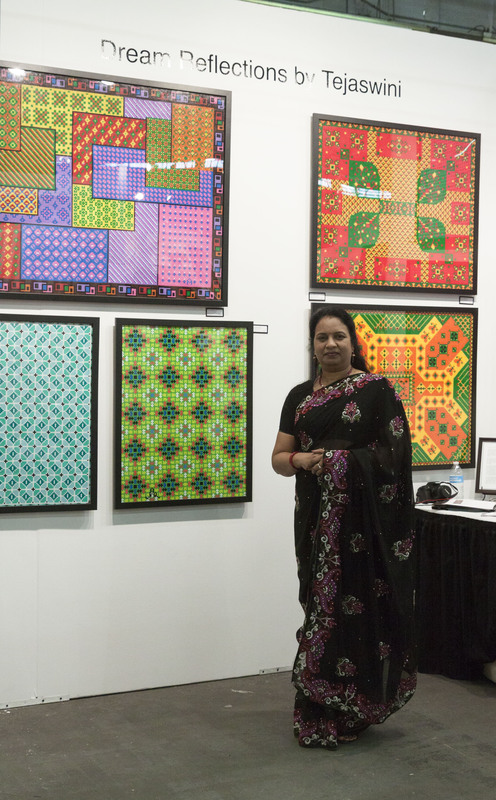 Alpana Mittal "Tejaswini" is a versatile artist with creations in multiple mediums. She has successfully experimented with water, oil, acrylics and even beads on canvas. Her specialty is creating artwork revolving around modernization of traditional themes including ancient Indian romanticism, folklores and legends. Born into an art loving family Alpana was exposed to art and its appreciation from early childhood. She chose "Fine Arts" as her major and has a M.F.A. from CCS University, India. She also has an "Arts Management" diploma from New York University. Her major contribution to the World of Art is her creation using beads on canvas. All of these artworks have been created based on the visions from her dreams, immediately after waking up from a nap. Hence, she has appropriately named the series as "Dream Series". This series uses fractals with a flavor of decorative patterns used for community and religious meetings across Asia, ranging from Tibetan Mandalas to Rangoli, the floor decoration art of south Asia.